A year after the government started showing rare firmness with donors about where it wanted foreign aid to go, it has finished drawing up a new aid policy to lay down the rules. The NC-UML coalition government wants to ensure that foreign aid directly contributes to economic growth and job creation through investment in hydropower, highways and other infrastructure. 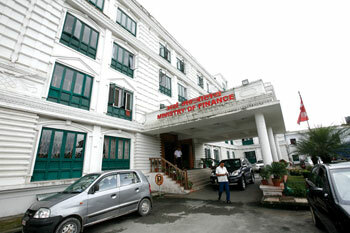 The Finance Ministry has been taking the lead in lobbying for the new directives with donors, while Chief Secretary Leela Mani Poudyal has sent directives to all line ministry secretaries to insist on foreign assistance only for medium and large-scale employment generation projects. "Monitoring and evaluating smaller projects running on foreign assistance puts extra financial burden on the government and when resources are scattered the quality isn’t always consistent," Poudyal wrote in a 11-point directive he sent in April to the National Planning Commission, the prime minister and finance minister. The government will not accept aid projects of less than $5 million. 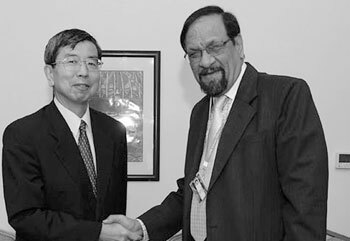 LET’S TALK: Finance Minister Ram Sharan Mahat (right) with Asian Development Bank (ADB) President Takehiko Nakao at a meeting on the sidelines of ADB´s 47th annual meeting, in Astana, Kazakhstan last week. The government’s new Development Cooperation Policy 2014 will replace the existing Foreign Aid Policy 2001, and will address aid fragmentation by focusing a large proportion of foreign aid on infrastructure, agriculture projects and less on human rights, democracy, inclusion and constitution writing. 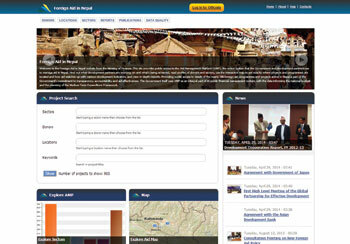 Marasini’s office recently released the Development Cooperation Report 2012-13 which stated that more than one-third of the $960 million foreign aid to Nepal through 580 projects last year bypassed the government’s budget. The government hopes that the new policy will direct most aid monies through the budget process. However, other Finance Ministry officials say although the percentage of directly-funded aid projects in 2012-2013 increased slightly from 23 per cent in 2011, it's because the government just couldn’t spend aid money. “Off-budget projects have increased because of the weak government mechanism to implement projects,” said one official, citing that only 36 per cent of foreign loans and 74 per cent of grants earmarked last year were ever spent. At the recent annual meeting of the Asian Development Bank in Astana of Kazakhstan, Finance Minister Ram Sharan Mahat stressed the need to channel foreign aid into infrastructure projects. However, most donors feel that unless the government works on spending capacity and delivery, it will not be able to raise more money from multi- and bi-lateral sources. In the last few months INGOs operating in Nepal have come under increased scrutiny. The government leaked to the press that only a handful of them submitted project and expenditure details to Social Welfare Council. But INGOs feel that the new requirement to report online through the Aid Management Platform (AMP), introduced by the Finance Ministry in 2010, is an extra burden and only deflects attention from the inefficiency of the Social Welfare Council, which monitors these organisations. The Finance Ministry is working with AIN to bring all INGOs under the AMP ambit to better monitor and coordinate aid flows to Nepal. So far, over 80 AIN members have received AMP-related training. “We hope bringing INGOs and donors under one platform to monitor aid flow will help to avoid duplication of similar projects and show donors and concerned ministries where foreign aid is concentrated,” says Tilak Bhandari of Finance Ministry who works with INGOs on aid management. Earlier this week, the Embassy of Denmark signed an agreement with UNDP for a grant assistance of Rs 9 million for support to the Finance Ministry’s AMP initiative. Why do countries realise what they have destroyed only once its all gone. The Manhunt winner proves it is important to be earnest.